I first learned about Good Humus Produce from buying their Royal Blenheim apricots and Suncrest peaches at the Davis Farmers Market and the Davis Food Co-op. When I later decided to join a local CSA, I discovered that they also offered a fruit CSA, so choosing to go with them was an easy decision! Good Humus Produce, owned by Jeff and Annie Main, is located on 20 acres of certified organic land in a little valley called the Hungry Hollow in Yolo County’s Capay Valley. Jeff and Annie Main are both fourth-generation Californians with a family history in agriculture, so farming is in their blood. Annie’s mom always had a garden and Annie remembers visiting her grandparents on their ranch in Santa Rosa, where they grew prunes and grapes. At one time they also had cows and chickens. Jeff and Annie Main have been two of the mainstays (no pun intended!) of the Davis and Yolo County organic food scene going back 40 years. In the 1970’s, there was a big Back-to-the-Land movement. Jeff (Civil Engineering) and Annie (Renewable Natural Resources) were students at UC Davis at that time and were part of the on-campus cooperative house called the Agrarian Effort. The Ag Effort was part of a buying club, which decided to turn the buying club into a store front. Jeff and Annie, who had been married a year were part of the building of the store and were the first produce buyers for the store that became the Davis Food Co-op. Annie and Jeff also helped start the Davis Farmers Market. They were living on a ranchette in Woodland, across from Howard Beeman and Susan Pelican, also farmers, who helped them get started in their farming adventure. Everything, the Davis Food Co-op, the Davis Farmers Market, and their venture into organic farming, started right around the same time and the Mains were right in the middle of it. When the Mains and their friends started farming, there was no question whether to farm organically or not. Rodale Press, which published Prevention and Organic Gardening Magazines, was a big influence on them. They were part of a group of five farmers in the beginning, renting 3 acres. This group eventually became three farms: Good Humus, Everything Under the Sun, and Capay Organic. Jeff’s dad, Ted Main, and Yolo County resident, Ed Looney, were their mentors. Both men had farmed in the days before chemical fertilizers and pesticides (pre-WW II) and were a great help. Ed joined the newly created Davis Farmers Market on the very second week of the market and continued selling there until his death in 1991.
together with a realtor friend found some property and bought it in 1983 for Jeff and Annie to farm. There was no written contract, just a verbal agreement and a handshake, and the Mains are still there to this day. They farm on 20 acres and have built a barn and a house, and have planted lots and lots of trees. Annie and Jeff purchased the property in 1993 and held their first annual Peach Party to celebrate. In 1984, their first child was born. Both their farm and family have continued to grow over the years. They now have three children, a daughter-in-law, and a grandson. 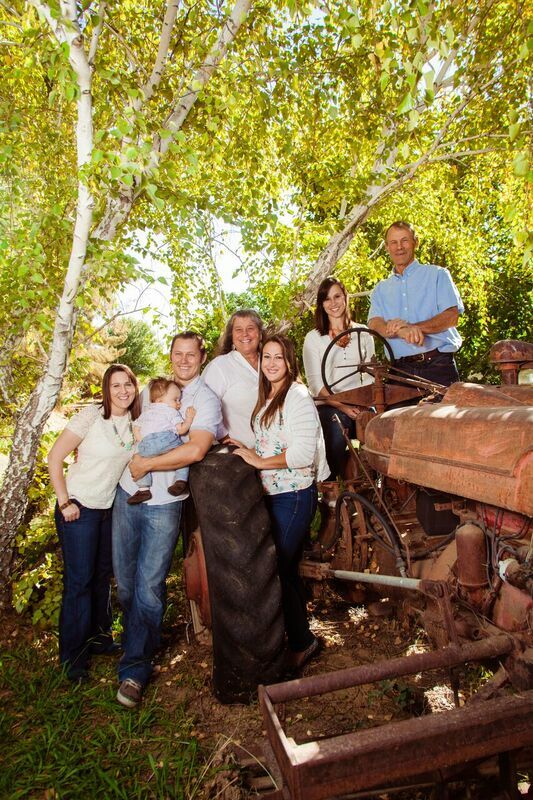 They also recently added an additional 10 acres with their son, Zach, and his wife, Nicole. Having spent their lives building their farm and knowing that high land prices have locked younger farmers out of the market, the Mains decided that they wanted to help create a sustainable farm that could continue from generation to generation. They created an agricultural easement as a legally binding way to ensure that their farm remains a farm for generations to come. This easement is the first of its kind in Yolo County, the second in Northern California, and one of only a handful of similar efforts in the United States. What makes this easement different is that they are asking that when the farm changes ownership that the next owners will have to live on the land, farm the land, farm sustainably, and make their income from farming. Jeff and Annie have two philosophies that have guided the growth of their farm. The first is a belief in the importance of diversity. 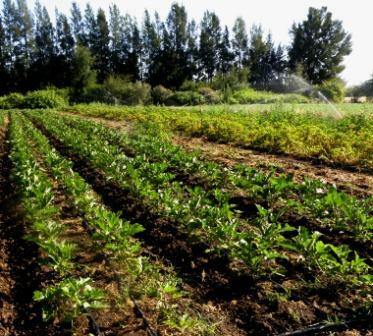 They have broken their fields into different areas containing mixed fruit orchards, framed by California native hedgerows, cover crops, annual and perennial herbs and flowers, and vegetables. Their farm doesn’t just provide food for people, but also provides habitat for an enormous range of species who like to live in and feed on the several hundred different types of plants growing there. Their other philosophy is to stay small and not to stray far from their community in sales and marketing. As Annie says, they do “a little of everything” and it is important to them that their work is done well. Their name, Good Humus, is a play on words and came about during a conversation with friends about the Good Humor man. If you are old enough, you will remember the Good Humor ice cream delivered by the Good Humor man. Because you need good humus (soil) and good humor to farm, the name “Good Humus” stuck. Unlike now, in those days, hummus (the food) was not very well-known, so no one confused the two! 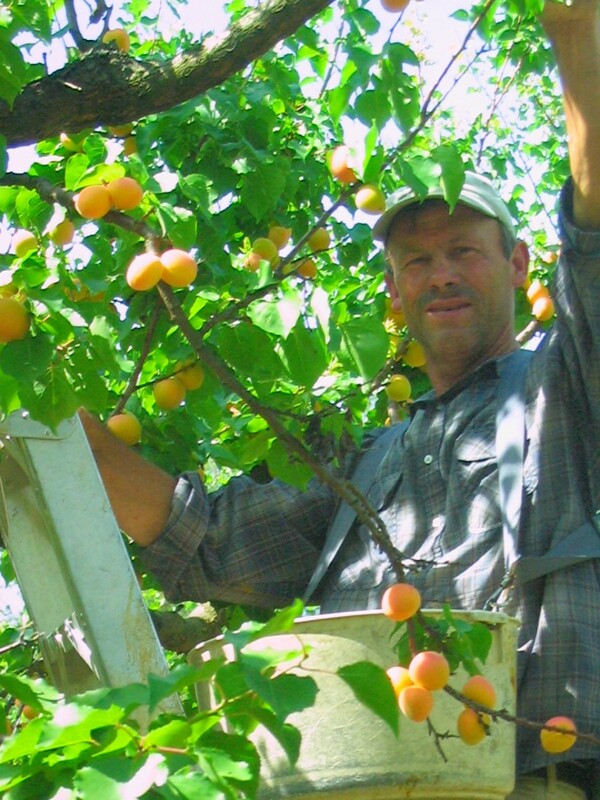 Good Humus Produce specializes in stone fruit and that season will be starting very soon. Don’t miss out on their amazing Royal Blenheim apricots (a smaller crop this year due to all the rain) and their fantastic Suncrest peaches! Jeff and Annie open their farm to visits on special occasions. Two upcoming events are the “Hats and High Tea” on Saturday, May 13th and the “Mother’s Day Capay Valley Garden Tour” on Sunday, May 14th. They also host spring visits for elementary school students, as well as their annual Peach Party for their CSA members in early August. Limited tickets are available for the “Hats and High Tea.” Please contact their daughter, Claire Main, at thegardenatgoodhumus@gmail.com for details and ticket information. To purchase tickets for the “Capay Valley Garden Tour,” call (530) 796-3464 or purchase online at www.thecapayvalleygardentour.com. Good Humus Produce and its products (vegetables, fruit, flowers, herbs, and jam) can be found at the Davis Farmers Market (Wednesday and Saturday), the Davis Food Co-op, Sacramento Natural Foods Co-op, and Natural Food Works in Davis. Good Humus has several quarterly CSA share options: vegetables (year-round), fruit (3 quarters of the year), flowers (spring through fall), and bread from Village Bakery (only available at certain Tuesday CSA drop-off points.) You can sign up for one or multiple options. The summer quarter will be starting soon, so now is a great time to learn more if you’re thinking about signing up!